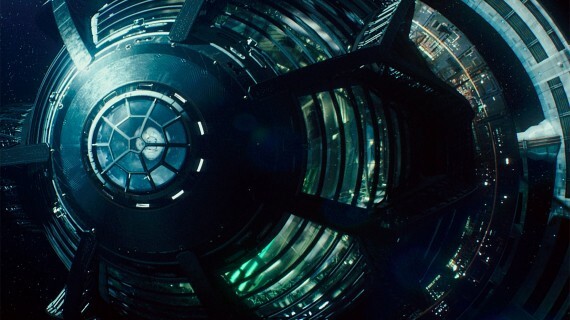 Humanity is reaching for the stars in Ascension , Syfy's three-part miniseries about a covert 1963 mission to send 600 people into space to find a new home, safe from the looming threat of nuclear attack. However, midway into their 100-year journey, a murder rocks the starship, unearthing the true intentions behind the quest. 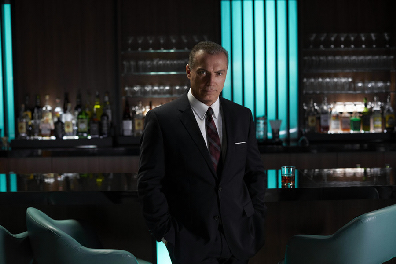 Ahead of tonight's finale, SPINOFF ONLINE spoke with The Sopranos veteran Al Sapienza about his role on the miniseries as Councilman Rose, being stuck in the 1960s, and playing opposite Battlestar Galactica favorite Tricia Helfer. Spinoff: What grabbed you about the premise for Ascension ? Al Sapienza: There's a big spoiler at the end of the pilot. I didn't know that. They sent me a script, but they did not have the real ending. They didn't want anyone to know. I got the script. I read it. I loved it. Just the concept alone, of this Kennedy mission to try and find life elsewhere without any influence of Earth culture — without any science, medicine or pop culture -– and basically evolving on your own for 51 years, excited me. I got the script, and they hired me the next day at noon. I didn't even audition. It was just over the phone. I fly up to Montreal. I shoot all day. The second day, I'm at lunch with Tricia Helfer, and she looks at me and her jaw drops. She goes, “You don't know the ending, do you?” I'm like, “What are you talking about?” I loved it more than when I first took the job. Then there's that whole other amazing aspect: the present politics, the present culture on the ship. I hope the show continues because I can't wait to see where it goes. How would you describe Councilman Rose and where he fits into the story? On the ship, like every organization, you have your leaders, such as your captains and officers. Then you have your political consultants that make the overall decision about stuff. I am a politician, so it's interesting to see how I evolved over 51 years without any influence from Earth. Politicians appear very differently in 1963. Even if they were self-centered people, you didn't see it on the outside. You had to dig really deep. I am a self-centered guy. I very much care about what happens to me, as opposed to what's better for the ship. I'm also having an affair with the captain's wife. I believe the ship would be better off having me run it and if I became the captain. So, I'm having an affair with his wife. I want his job. I want to take over the ship. It's pretty Richard Nixon, if you ask me. Paint us a picture. What is life like on this ship? As big as it is, just imagine being confined to two giant stadiums. There are only so many movies you are ever going to see. It's like being on a gigantic cruise ship for the rest of your life. On the up side, we do believe we are doing something great for mankind and for Earth. We have a mission to serve and to sacrifice to help our species, which when we left, the president believed was going to be in extreme peril. It's funny, when we got on that ship, when I walked on that ship, I was only a child. Most of the crew is now second generation, and the first crew is dead. That second generation didn't choose this; they didn't choose to serve. Many of them feel trapped and betrayed by their parents. They feel cheated instead of that sense of the Peace Corps or the best and the brightest. You have a lot of turmoil on board right now with these people who don't even want to be there. It creates a lot of conflict and a lot of drama. Executive Producer Jason Blum basically called Ascension a “time capsule.” What's interesting about having these people stuck with 1963 morals and values? It's amazing. Just imagine if Martin Luther King never happened, the civil rights movement never happened. Women never got their equality in America. Women never got equal pay or the respect that they deserved. It's still a chauvinistic world, like Mad Men . For 51 years, these people never had a homicide or an involuntary manslaughter. Fifty-one years with no murder. As President Kennedy said, that first crew was the best and the brightest. They volunteered to help mankind. They were gentlemen. We don't even know how to investigate this murder. We don't know modern forensics. Our chief officer refers to Raymond Chandler books and old detective stories to figure out how to investigate this murder. Meanwhile, Rose is having an affair with the captain's wife, Viondra Denniger, played by Tricia Helfer. Surely, that had to be one of the perks of this role? Absolutely. I've said that in interviews. They ask, “What's your favorite scene?” I'm like, “I love scenes with Tricia and my fights with Brian [Van Holt]. Tricia is a perfect 10 on the outside and the inside. She doesn't have the personality that fits in that body. She is the nicest, most down-to-Earth, sweetest woman. She's a great lady. I'm not just saying that. Both Rose and Viondra have their own agendas and quests for power. Who is using who? That's the deal you don't know. That's the thing about it. She's sleeping with me to get information for her husband. He kind of knows and he kind of doesn't know. He never admits he knows. He obviously doesn't like it. I play my character like I'm in love with her. It's just more fun. I could just be sleeping with her to get information also, but it's a much more interesting choice, and adds depth to the character, to make it that I'm really in love. Yes, I'm trying to get information. Yes, I want to be the captain. It's much more interesting if I play all those different levels. It's kind of like Star Trek meets Lost meets Dynasty . Rose wants to become captain. What he is willing to do to achieve that goal? That's a good question. It depends what the writers come up with. If they write it, I have to do it. I don't know myself. I don't know how far he'll go and how crazy he is yet. We've only done six episodes. We'll see. But, I think he'll go pretty far. He wants to command the ship. He wants Viondra. Those are two things he wants to possess and control and have under his belt. Syfy will rerun the first two episodes of Ascension today beginning at 5:30 p.m. ET/PT, leading to the finale premiere at 9 p.m.